Being able to identify microbes in real time aboard the International Space Station, without having to send them back to Earth for identification first, would be revolutionary for the world of microbiology and space exploration. The Genes in Space-3 team turned that possibility into a reality this year, when it completed the first-ever sample-to-sequence process entirely aboard the space station. The ability to identify microbes in space could aid in the ability to diagnose and treat astronaut ailments in real time, as well as assisting in the identification of DNA-based life on other planets. It could also benefit other experiments aboard the orbiting laboratory. Identifying microbes involves isolating the DNA of samples, and then amplifying – or making many copies - of that DNA that can then be sequenced, or identified. The investigation was broken into two parts: the collection of the microbial samples and amplification by Polymerase Chain Reaction (PCR), then sequencing and identification of the microbes. NASA astronaut Peggy Whitson conducted the experiment aboard the orbiting laboratory, with NASA microbiologist and the project’s Principal Investigator Sarah Wallace and her team watching and guiding her from Houston. As part of regular microbial monitoring, petri plates were touched to various surfaces of the space station. Working within the Microgravity Science Glovebox (MSG) about a week later, Whitson transferred cells from growing bacterial colonies on those plates into miniature test tubes, something that had never been done before in space. Once the cells were successfully collected, it was time to isolate the DNA and prepare it for sequencing, enabling the identification of the unknown organisms – another first for space microbiology. An historic weather event, though, threatened the ground team’s ability to guide the progress of the experiment. “We started hearing the reports of Hurricane Harvey the week in between Peggy performing the first part of collecting the sample and gearing up for the actual sequencing,” said Wallace. When JSC became inaccessible due to dangerous road conditions and rising flood waters, the team at Marshall Space Flight Center’s Payload Operations Integration Center in Huntsville, Alabama, who serve as “Mission Control” for all station research, worked to connect Wallace to Whitson using Wallace’s personal cell phone. With a hurricane wreaking havoc outside, Wallace and Whitson set out to make history. Wallace offered support to Whitson, a biochemist, as she used the MinION device to sequence the amplified DNA. The data were downlinked to the team in Houston for analysis and identification. Those As, Gs, Cs and Ts are Adenine, Guanine, Cytosine and Thymine – the four bases that make up each strand of DNA and can tell you what organism the strand of DNA came from. Soon after, the samples returned to Earth, along with Whitson, aboard the Soyuz spacecraft. Biochemical and sequencing tests were completed in ground labs to confirm the findings from the space station. They ran tests multiple times to confirm accuracy. Each time, the results were exactly the same on the ground as in orbit. “We did it. Everything worked perfectly,” said Sarah Stahl, microbiologist. Developed in partnership by NASA’s Johnson Space Center and Boeing, this National Lab sponsored investigation is managed by the Center for the Advancement of Science in Space. Genes in Space-1 marked the first time the PCR was used in space to amplify DNA with the miniPCR thermal cycler, followed shortly after by Biomolecule Sequencer, which used the MinION device to sequence DNA. Genes in Space-3 married these two investigations to create a full microbial identification process in microgravity. “It was a natural collaboration to put these two pieces of technology together because individually, they’re both great, but together they enable extremely powerful molecular biology applications,” said Wallace. For more information about the investigations happening every day aboard the orbiting laboratory, follow @ISS_Research. Being able to identify microbes in real time aboard the International Space Station, without having to send them back to Earth for identification first, would be revolutionary for the world of microbiology and space exploration, and the Genes in Space-3 team turned that possibility into a reality this year when it completed the first-ever sample-to-sequence process entirely aboard the space station. This advance could aid in the ability to diagnose and treat astronaut ailments in real time, as well as assisting in the identification of DNA-based life on other planets. It could also benefit other experiments aboard the orbiting laboratory. 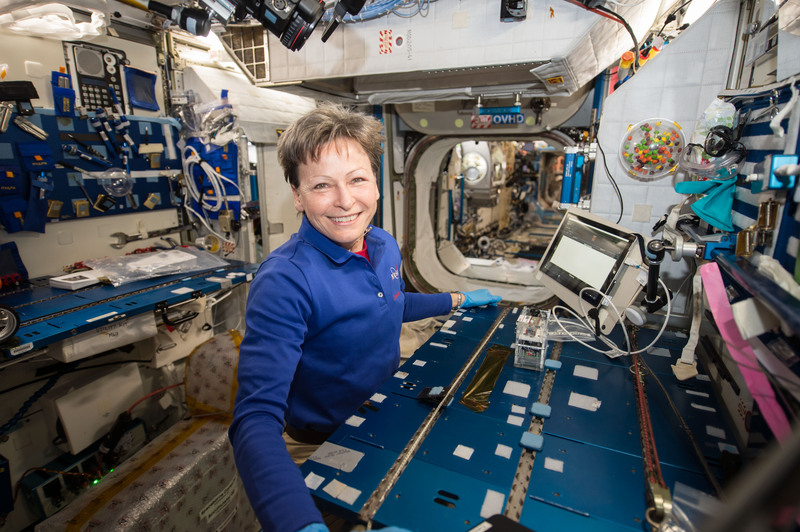 NASA astronaut Peggy Whitson performed the Genes in Space-3 investigation aboard the space station using the miniPCR and MinION, developed for previously flown investigations. 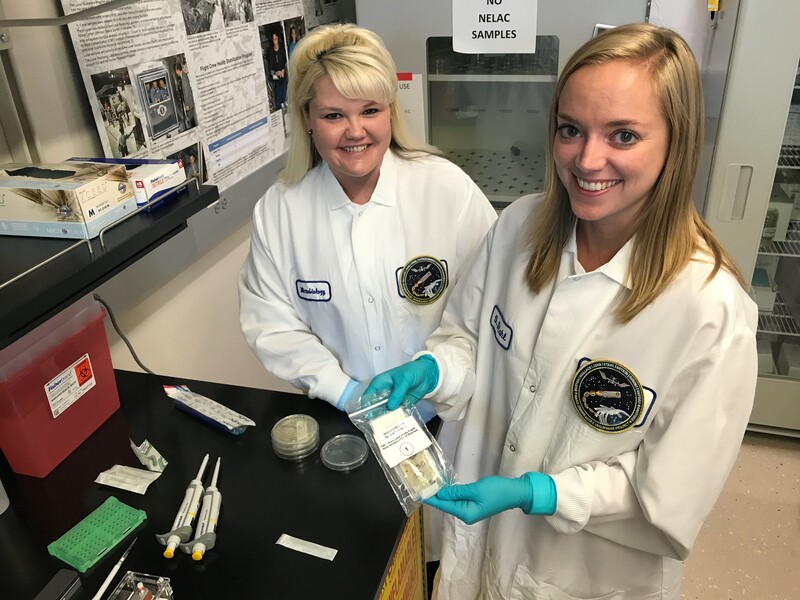 Sarah Wallace (L), NASA microbiologist and Genes in Space-3 principal investigator, and Sarah Stahl (R), microbiologist, are seen in their Johnson Space Center lab with the in-flight sample from the Genes in Space-3 investigation. The Genes in Space-3 team worked throughout Hurricane Harvey to ensure operations continued on the space station. 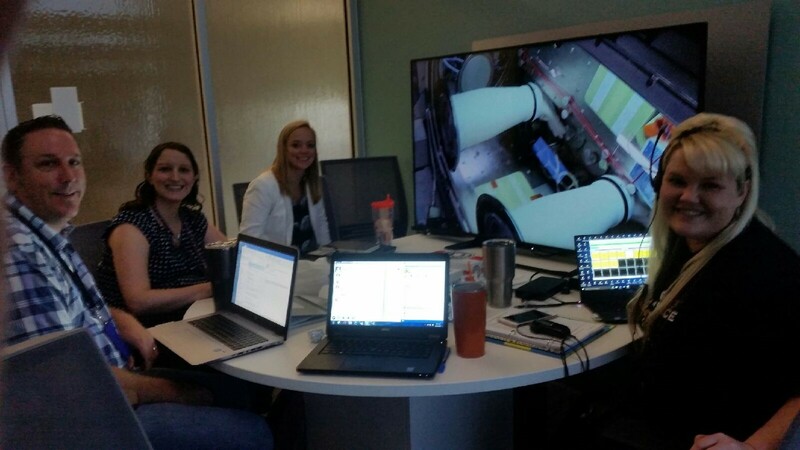 Pictured are Aaron Burton, Kristen John, Sarah Stahl and Sarah Wallace as they watch NASA astronaut Peggy Whitson work within the Microgravity Science Glovebox (MSG) during part one of the investigation. Working within the Microgravity Science Glovebox, Whitson transferred cells from growing bacterial colonies on petri dishes into miniature test tubes, something that had never been done before in space.